You'll forgive me if deja vu is striking. This is the third time we've had a chance to test this chassis from MSI (the first being the iBuyPower Valkyrie CZ-17 and the second being the CyberPower FangBook). Each time there's been an incremental hardware update, but this is also the first time we've seen this notebook directly from MSI and more than that, this flagship edition brings a tremendous amount of hardware to bear. 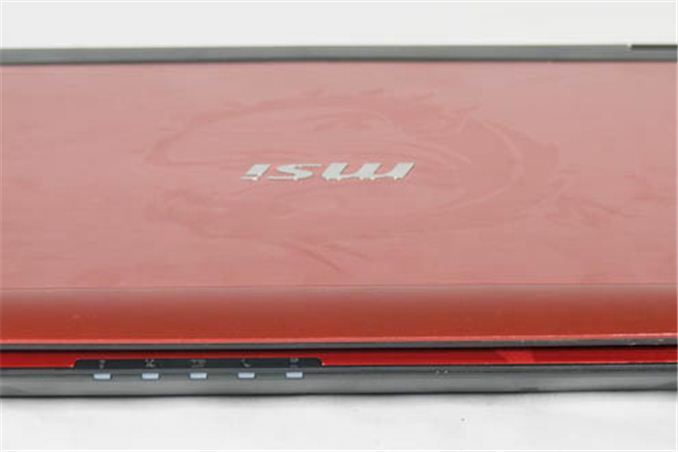 The GT70 Dragon Edition may have the same basic chassis, but MSI has secret sauce hiding under the hood. While it may seem like there's not much left to say about this chassis that hasn't already been addressed in those previous reviews, as it turns out, there are both some new wrinkles that materialize with this ultra high end build and some old wrinkles that are finally making themselves apparent. 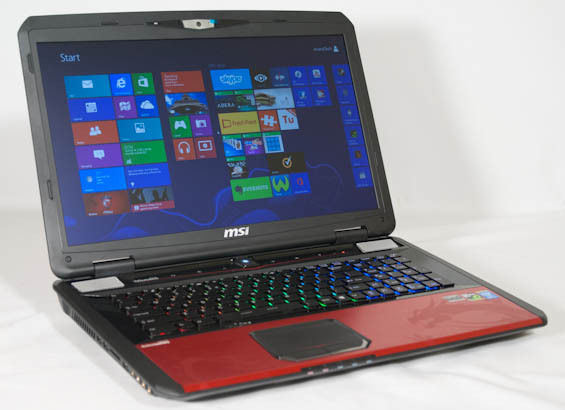 First, this review isn't just about the MSI GT70. Under the hood we also have the benefit of testing Intel's shiny new Core i7-4700MQ based off of the new Haswell microarchitecture. We're also getting to check out NVIDIA's brand new GeForce GTX 780M, the first full GK104 part available in a notebook. The 680M was no slouch, but with the 780M we're getting all of the shader clusters, a healthy boost in clocks, and NVIDIA's Boost 2.0 technology. Dimensions 16.9" x 11.3" x 2.2"
Starting from the top, the new Dragon Edition (searchable as Dragon Edition 2) features an Intel Core i7-4700MQ socketed quad-core CPU. More informed readers will note that Haswell chips don't feature higher clocks than their outgoing Ivy Bridge counterparts, so all CPU performance improvements are purely architectural. The i7-4700MQ, outside of its GPU, is on paper identical to the outgoing i7-3630QM: 2.4GHz nominal clock speed, with turbo bins of up to 3.2GHz on three or four cores, 3.3GHz on two cores, and 3.4GHz on just one core. As a flagship notebook it's a bit surprising that MSI opted for the entry-level Haswell quad, but you'll see CPU performance isn't really the limiting factor here. Attached to the i7-4700MQ is 32GB of DDR3-1600, more than most users are going to ever need but appreciated nonetheless. The shiny new HM87 chipset brings much needed 6Gbps support across all of the SATA ports, and MSI takes advantage of this by configuring three SanDisk X100 SandForce-based mSATA SSDs in RAID 0. While this is extremely fast and capable of being much, much faster than just using a single SSD, there's no subjective difference. The biggest change a user can make is just jumping to a good SSD in the first place, and I've always been skeptical of SSDs in striped RAID for consumer use. Of course, the other big news is the NVIDIA GeForce GTX 780M, and despite being based on the same silicon as the GeForce GTX 680M, NVIDIA brings to bear a very healthy performance boost. Everything is up but the TDP: from the 680M's 1344 CUDA cores we're up to GK104's full 1536, GPU clocks are up from the nominal 720MHz to a bare minimum 771MHz, and memory speed is up from 3.6GHz to a fantastic 5GHz. Boost clocks on the 780M ensure that it's constantly performing as fast as it can, and in testing I saw it spending a substantial amount of time over 900MHz, essentially biting the heels of a desktop GTX 680's stock clock. On top of that, GK104 tends to be memory bandwidth limited, so the nearly 50% faster memory clocks should go a long way towards improving performance further. Finally, MSI has gone with Killer Networking across the board. While I'm iffy on the need for Killer wired networking, Jarred has personally tested their wireless and found it to be a substantial upgrade over conventional Centrino wireless networking. Dual-band support also gets the Dragon Edition a pat on the head.